Now the first thing I did was check out the Healing Spells we currently use. As of right now there are no major changes to them with the exception that they produce bigger heals. 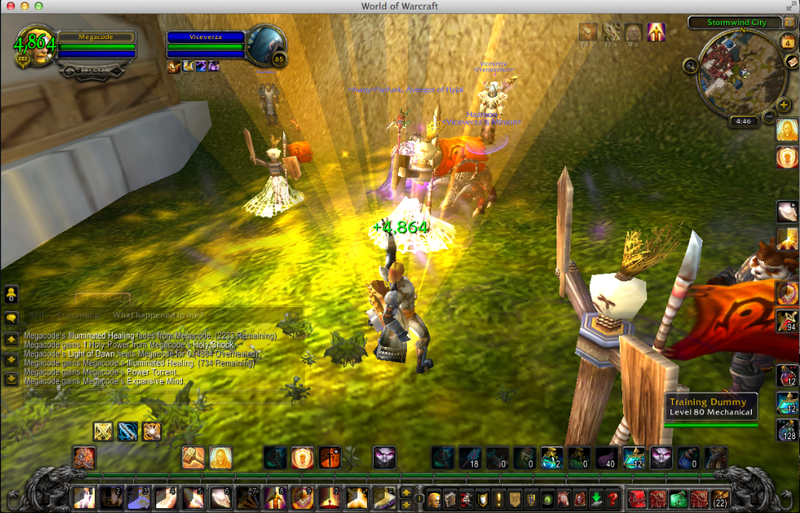 I went over to the test dummy section in Stormwind and practiced on the dummies and a few actual characters. Keep in mind I did this non buffed and in current Dragon Soul raid gear so results will vary, especially when it goes live and we start replacing Cataclysm gear with MoP upgrades so the heals will then get bigger. Flash of Light: Still our very fast heal that uses a lot of mana. It was putting out 30k heals when I tested it. Holy Shock: Instant cast heal with a 6 sec cooldown. It healed for 32K so like I said, bigger heals. Holy Radiance: This had a change to the 10 yard splash heal. It now disperses 50% of the initial heal to players within 10 yards and no longer has a 3 sec “HoT”. I used this on some grouped players. Initial HR heal was for 10k on targeted player. It splashed onto six other players hitting five with 5k and one with a 10k crit. Beacon of Light: Pretty much the same spell but with a few minor changes. It now transfers 15% of Holy Radiance and says all other healing spells (except Holy Light 100%) transfer 50%. I wonder if that will include our Level 90 healing spell Lights Hammer ? Word of Glory: Instant heal that consumes Holy Power. With 3 Holy Power I healed for 33k. Light of Dawn: Instant cast spell which consumes Holy Power. Now instead of healing as a cone in front of you, it emanates a wave around you (much like a priests Circle of Healing) healing up to six injured members. I was healing for around 14k. The new visual affect is pretty cool. So thats it for the Healing Spells I played around with. Next I went ahead and looked at the new talents system. I will briefly mention the ones I liked. This is subjective to my liking and style of healing so don’t take it as the have to have talent. The new talent system is set up so that all grouped talents have similarities but its up to you which one suits your fancy for the particular fight. Speed of Light: Increases your movement speed by 70% for 8 sec. I like having this option at my disposal when its off the 1 min cooldown. Ready to use when a bump in speed might save my hide. This came in handy for Ragnaros and Morchok. I’m also happy to see it separated from our Divine Protection and now won’t feel like it’s a waste of one buff over another buff. However we will lose 3% spell haste but I’m sure it all gets worked out. Fist of Justice: Stuns the target for 6 seconds. 30 sec cooldown. (Replaces Hammer of Justice). What can I say, I actually used HofJ. Came in real handy on those fire elementals on the Ragnaros fight and on the Val’kyr in Lich King fight. Sacred Shield:Protects the target with a shield of Holy Light for 30 sec, which increases the critical chance of your Flash of Light on the target by 30%. The shield also absorbs 5879+0.52*holy spell power damage when the target takes damage, but no more than once every 6 sec. I am really glad to see this coming back in a modified way. In WotLK we had SS which was used on tanks to help mitigate damage but was removed from our arsenal in Cataclysm. I anticipate throwing this onto a tank whom I know is going to be getting hit with heavy damage soon. As of this Beta build, no cooldown 🙂 Can’t see that going live. Hand of Purity: Places a hand on the friendly target reducing the damage of harmful periodic effects by 70% for 6 seconds. 1 minute cooldown. If you’ve read my prior posts then you know that I’m a big user of Paladin Hands. Damage mitigation is a big part of our arsenal and to have another one added makes me really happy. Ok, picture this. Raid boss is about to hit the tank with Big Damage. Throw a Sacred Shield and Hand of Purity on the tank. Serious damage mitigation there. If need be follow it up with another Sacred Shield and Hand of Sacrifice (since HofP is on a 1 min cooldown). Feels almost overpowered too me. I’m sure SS will be getting its own cooldown. Holy Avenger: Abilities that generate Holy Power will generate 3 charges of Holy Power for the next 15 sec. 2 minute cooldown. I tested this out on some players and it put out some nice “AoE” heals. I was able to spam Holy Radiance, 3HP Light of Dawn, HR, LofD, HR, LofD. Thats right, three of each which was over a 15 second period. Thats a ton of raid healing if you ask me. Looks to me like Blizzard isn’t putting our Raid healing capabilities on the old chopping block 🙂 If your tank healing, pop Holy Avenger and with Tower of Radiance use a Divine Light, 3HP Word of Glory, DL, WoG, DL, WoG…..for 15 seconds during times of heavy tank damage. Lights Hammer: Hurl a Light-infused hammer into the ground where it will blast a 10 yard area with Arcing Light for 16 seconds. “Arcing Light” deals 5,125 Holy damage to enemies within the area and 5,125 healing to allies within the area every 2 seconds. Because I’m not level 90, I wasn’t able to play around with this talent, however, I think it will be a spell that I will get to know very intimately 🙂 This spell would have been very useful for certain fights in Dragon Soul where we are grouped up and taking damage from adds (Heroic Yor’sahj). 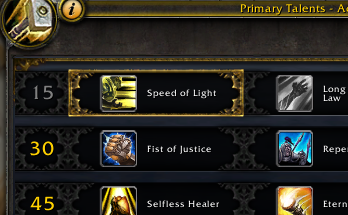 Before I end this post I wanted to mention two Holy Paladin specific abilities that we get in MoP. Boundless Conviction: You may store an additional 2 Holy Power beyond the maximum of 3. No ability ever consumes more than 3 Holy Power. This is a passive ability we always have. I tested this out and it’s definitely a nice ability to have. Our bar still shows 3 holy power max but you can accumulate 2 more beyond it. If you end up using a Word of Glory or Light of Dawn you still have 2 holy power left. Means we’ll be getting more use out of our WoG/LoD healing spells. Daybreak: After casting Holy Radiance, your next Holy Shock will also heal other allies within 10 yards of the target for an amount equal to the original healing done, divided evenly among all targets. This has been completely revamped from its current state and I feel its been upgraded. I tested this out as well and I liked the results. I healed someone with HR(healed for 10k, transferring 5k to 6 allies) which proc’d Daybreak. I then followed up with a 21k HS which then splashed heals to the allies around the person I was healing. It was around 2.1k to each of the 6 characters I believe. Daybreak proc’s after every HR so unless there’s big raid damage going out, HR/HS seems like a good rotation for raid healing.